11 And Samuel said unto Jesse, Are here allthy children? And he said, There remaineth yet the youngest, and, behold, he keepeth the sheep. And Samuel said unto Jesse, Send and fetch him: for we will not sit down till he come hither. A few miles south of Jerusalem, "the city of the great King," is Bethlehem, where David, the son of Jesse, was born more than a thousand years before the infant Jesus was cradled in the manger and worshiped by the Wise Men from the East. Centuries before the advent of the Saviour, David, in the freshness of boyhood, kept watch of his flocks as they grazed on the hills surrounding Bethlehem. The simple shepherd boy sang the songs of his own composing, and the music of his harp made a sweet accompaniment to the melody of his fresh young voice. 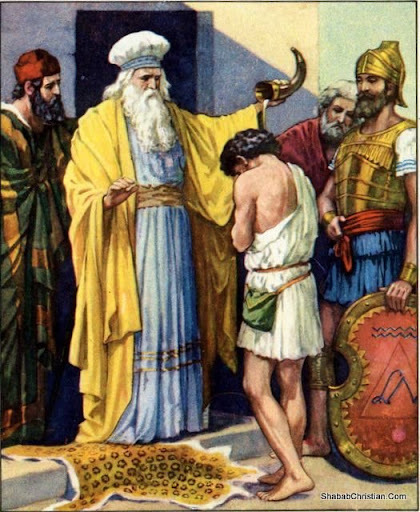 The Lord had chosen David, and was preparing him, in his solitary life with his flocks, for the work He designed to commit to his trust in after years. Author of every good and perfect gift. Daily revelations of the character and majesty of his Creator filled the young poet's heart with adoration and rejoicing. In contemplation of God and His works the faculties of David's mind and heart were developing and strengthening for the work of his afterlife. He was daily coming into a more intimate communion with God. His mind was constantly penetrating into new depths for fresh themes to inspire his song and to wake the music of his harp. The rich melody of his voice poured out upon the air, echoed from the hills as if responsive to the rejoicing of the angels' songs in heaven.